While the story draws you in immediately, and the performances are uniformly solid, this film is really two virtuoso battle scenes bookending Steven Spielberg’s obvious story-telling, which is not helped by some leaden dialogue and a platoon of stock characters (sensitive medic, clueless bookworm, Italian tough, Jewish wisecracker, Irish tough, Southern Bible-Belt sharpshooter). However, some films transcend criticism. Saving Private Ryan’s roundly lauded re-creation of D-Day is jarring and innovative. Spielberg brilliantly changes the vantage point of the viewer, and the speed and unearthly horror of mass battle is depicted in frightening detail. He tracks the advance on the beach, then moves to a hand-held camera, then to the view of a German gun nest, then back to the beach, with such swiftness that you lose your breath at times. The effect of the opening scene leaves you lost for the next ten minutes. In the theater, I was stunned that everyone was hunkered down in their seats. When you do reorient, the film becomes a more conventional war film/morality play. Spielberg, as usual, has his characters pound away at his message for fear we won’t “get it.” His foreshadowing is also clumsy. Still, the battle scenes that ensue after the landing remain true to history. The ingenuity of the GI’s – which might otherwise strike a viewer as contrived – is conveyed by Spielberg. The crucial role of firepower, the slap-dash organization of discombobulated soldiers, the treatment of German prisoners, and the heroic level of unit cohesion – all receive effective dramatization in the film. In the end, however, Saving Private Ryan works as a particularly American film. Neither a rah rah polemic or a cynical anti-war tract, the movie communicates the basic truth that the loyalties of combat soldiers start (and often end) with fellow soldiers. Spielberg’s platoon is cleaved together as a unit, but the unit is not only threatened by the enemy, but by what seems a questionable endeavor – to save one private because all of his brothers have been killed. The grisly reality of slaughter of many for the saving of more, and the slaughter of more for the saving of one, is juxtaposed, creating the crisis for Hanks, the unit leader, and the audience. Saving Private Ryan works on a different level as well. The movie transports the viewer to a time when the costs of everyday life were greater, and for higher purpose. In this manner, Ryan can be criticized for engaging in too much “greatest generation” nostalgia, but it is useful to compare the film to contemporaries. The best film from the year before Ryan’s release was the comedy As Good As It Gets. It was about a spoiled, rich romance writer with OCD, which meant he could not refrain from gay-bashing his neighbor. His heroism was in learning to love while simultaneously not being cruel to anyone in proximity. I liked that movie. Nicholson was a crack-up. But I wonder how his character would have fared on Omaha Beach. 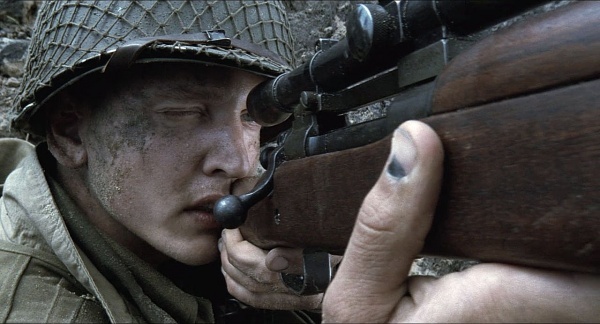 Postscript: in the wake of this film, Hanks and Spielberg partnered to produce Band of Brothers for HBO, a beautifully shot and much better written miniseries covering one unit from D-Day to Hitler’s Eagle’s Nest.